To Cite: Barati M, Farnia L, Eshaghi M A, Talebi-Taher M, Farhadi N. Diagnostic Performance of Brain Natriuretic Peptide in Patients Suspected to Sepsis, Arch Clin Infect Dis. 2013 ; 8(4):e19310. doi: 10.5812/archcid.19310. Background: One of the main components involving in the pathogenesis and prognosis of sepsis and septic shock is natriuretic peptide. Hemodynamic changes in sepsis or septic shock might explain increased plasma levels of these peptides circulations. Objectives: The present study aimed to assess the value of brain natriuretic peptide (BNP) in prediction of sepsis state and its related morbidity. We also attempted to determine the best cutoff point of BNP for diagnosis of sepsis state in those with critical illnesses, admitted to the hospital. Patients and Methods: In a cross-sectional study on critically ill patients referred to infections unit of Hazrat Rasoul Akram Hospital, the enrolled patients were assigned to one of the sepsis (n = 30) and nonsepsis (n = 30) groups, based on their results of blood culture and clinical manifestations. Plasma level of BNP was measured by immunoassay. Results: In-hospital mortality was only observed in one patient suffering from sepsis. Hospital length of stay (LOS) was significantly longer in the sepsis group compared with the nonsepsis one (17.47 ± 10.10 days versus 7.93 ± 2.92 days). The plasma BNP level, as a marker, was significantly higher in the sepsis group than the nonsepsis one (786.87 ± 164.11 ng/mL versus 154.57 ± 44.67 ng/mL, P = 0.039). The BNP level was significantly correlated with some baseline variables including respiratory rate (beta = 0.295, P = 0.022) and ESR measurement (beta = 0.296, P = 0.022), but not with other characteristics. Through multivariable linear regression analysis, having other patients’ variables information including demographics and hemodynamic parameters, the BNP level was significantly higher in the sepsis group compared with the nonsepsis one (odds ratio = 1.008, P = 0.046). 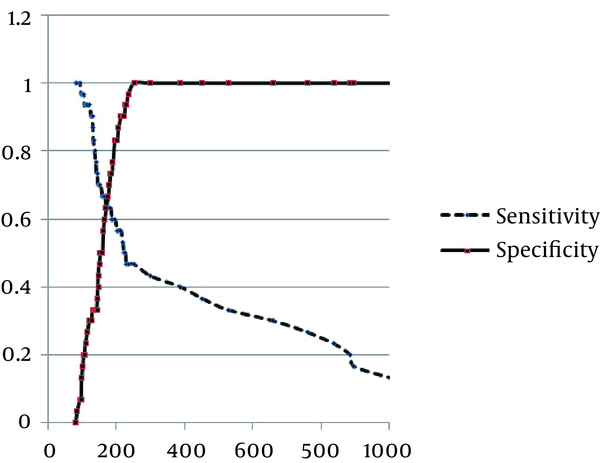 According to the receiver operating characteristic (ROC) curve analysis, BNP measurement had an acceptable value for discriminating sepsis and nonsepsis states (c = 0.734, 95% CI: 0.605-0.864, P = 0.002). The optimal cutoff point of BNP for discriminating sepsis and nonsepsis states was 170 ng/mL, yielding a sensitivity of 66.7% and a specificity of 60.0%. Conclusions: Elevated BNP level was associated with a significantly increased risk of sepsis state in critically ill patients. Sepsis and septic shock are mainly accompanied by activation of the immune mediator cells and in this regard, inflammatory response causes multiple organ failure and even death. Sepsis is identified by presence of an infective state combined with some typical clinical and laboratory findings of infection (1); however, the infective organism may only be found in less than 50% of affected patients (2). Despite considerable progression in treatment of sepsis, recent therapy strategies could not substantially lower the mortality of sepsis and its related mortality rate remained as high as 30-50% (3). One of the main components involving in the pathogenesis and prognosis of sepsis and septic shock is natriuretic peptide, comprised of at least eight structurally-related amino acid peptides, stored as three different prohormones of atrial natriuretic peptide (ANP), brain natriuretic peptide (BNP), and C-type natriuretic peptide (CNP) (4). It has been suggested that hemodynamic changes in sepsis or septic shock such as reduced ejection fraction in presence of an increased diastolic volume as well as pressure of both ventricles, and increase of pulmonary arterial pressure (5, 6), might explain increased plasma levels of circulating natriuretic peptides, derived from both ventricles of the heart in those patients. Besides, a positive association between cardiac dysfunction indices and elevated plasma levels of natriuretic peptides, especially BNP, has been reported (7, 8). These findings suggest that these peptides especially BNP might reflect and predict presence of sepsis and septic shock as well as their related mortality and morbidity. The present study aimed to assess the value of BNP in prediction of sepsis state and its related morbidity. We also attempted to determine the best cutoff point of BNP for diagnosis of sepsis state in those with critical illnesses, admitted to the hospital. In a cross-sectional study on critically ill patients referred to the infections unit of Hazrat Rasoul Akram Hospital, the enrolled patients were assigned to one of the sepsis (n = 30) or nonsepsis (n = 30) groups, based on their results of blood culture and clinical manifestations. Therefore, final diagnosis of sepsis in the admitted patients was based on presence of positive blood culture or at least two of the following criteria: 1) fever or hypothermia, 2) heart rate > 90 per minute, 3) respiratory rate > 20 per minute, and 4) leukocytosis (white blood cell count > 12000 mm3) or leucopenia (white blood cell count < 4000 mm3). The control group members were selected from other admitted patients with diagnoses other than sepsis. Initially, targets of the study were explained to the subjects and written informed consents were obtained from all. The first assessments included blood culture, cell blood count, ESR and CRP, and evaluation of vital signs. In the next step, plasma level of BNP was measured using immunoassay with sensitivity of 5.25 ng/L and acceptable upper and lower limitations of 10 to 3800 ng. All findings were finally assessed by two specialists of infectious diseases. Primary endpoint of the study was assessing the differences in clinical, laboratory and inflammatory parameters as well as mortality and LOS between the two groups. Secondary endpoint of the study was measuring the plasma level of BNP and determining its value for discriminating sepsis and nonsepsis states. Finally, the best cutoff point for this discrimination was determined. Results were presented as mean ± standard deviation (SD) for quantitative variables and summarized by absolute frequencies and percentages for categorical variables. Categorical variables were compared using chi-square test or Fisher's exact test, when more than 20% of cells with expected count of less than five were observed. Quantitative variables were compared using t-test or analysis of variance (ANOVA). Multivariate linear regression analysis was used to compare the between-group differences in the BNP level, with presence of study confounders including demographics parameters and hemodynamic indices. A receiver operating characteristic (ROC) curve was used to identify the best cutoff point to maximize the sensitivity and specificity of discriminating sepsis and nonsepsis states. For the statistical analysis, the statistical software SPSS version 19.0 for windows (SPSS Inc., Chicago, IL) was used. P values of 0.05 or less were considered statistically significant. Baseline characteristics of the study groups are presented in Table 1. Mean age of the participants was 59.78 ± 21.82 years in the sepsis group and 42.73 ± 19.87 years in the control group. No difference was found in the male distribution between the two groups (53.3% versus 66.7%). the most frequent etiologies of sepsis were pneumonia (43.3%), followed by urosepsis (40.0%) and wound infection (6.7%). Positive blood culture was only revealed in 30.0% of the septic group. The average of white blood cell count, neutrophil percentage, ESR and CRP were all significantly higher in the septic group than the control group. Prevalence of diabetes mellitus was also higher in the sepsis group, while no differences were observed in prevalence of other underlying disorders including hypertension, hyperlipidemia, cerebrovascular events, and renal failure. In-hospital mortality was only observed in one patient suffering from sepsis. LOS was significantly longer in the sepsis group than the nonsepsis one (17.47 ± 10.10 days versus 7.93 ± 2.92 days). The plasma BNP level, as a marker, was significantly higher in the sepsis group than the nonsepsis one (786.87 ± 164.11 ng/mL versus 154.57 ± 44.67 ng/mL, P = 0.039). The level of BNP was significantly correlated with some baseline variables including respiratory rate (beta = 0.295, P = 0.022) and ESR measurement (beta = 0.296, P = 0.022), but not with other characteristics. Through multivariable linear regression analysis, having other patients’ variables information, including demographics and hemodynamic parameters, the BNP level was significantly higher in the sepsis group compared with the nonsepsis one (odds ratio = 1.008, 95% CI = 1.000-1.016, P = 0.046). According to the ROC curve analysis (Figure 1), BNP measurement had an acceptable value for discriminating sepsis and nonsepsis states (c = 0.734, 95% CI: 0.605-0.864, P = 0.002). 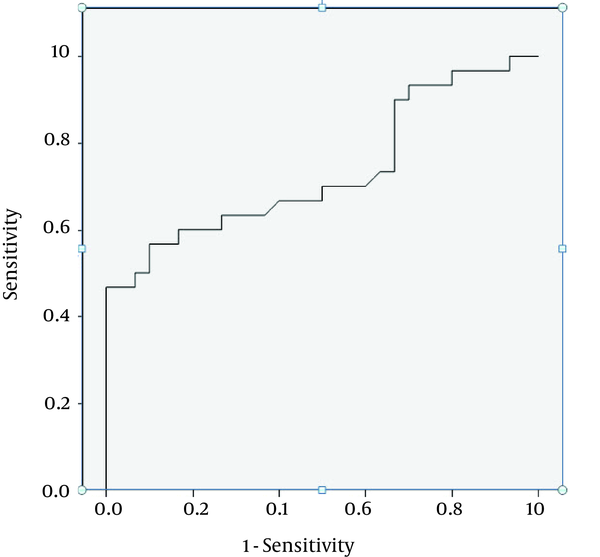 The optimal cutoff point of BNP for discriminating sepsis and m nonsepsis states (Figure 2) was 170 ng/mL, yielding a sensitivity of 66.7% and a specificity of 60.0%. a Abbreviations: CRP, C-reactive protein; ESR, erythrocyte sedimentation rate; WBC, white blood cell. b Data are presented in mean ± SD or No. (%). The best cutoff point for BNP was 170 ng/mL. The present study showed that elevated BNP level was associated with significantly increased risk of sepsis state in critically ill patients referred to hospital. It was consistent with other studies (9-14). As such, measurement of BNP may be a simple method of risk stratification in septic patients (15). Some studies showed that BNP level elevation in patients with sepsis can be considerably high, even though cardiac depression is not obvious. This event can occur following sepsis-induced biventricular dilatation (16, 17), stimulation of lipopolysaccharide (17) or proinflammatory cytokines (18, 19), volume resuscitation (20), and sepsis-associated acute lung injury or acute respiratory distress syndrome (21). Clinical severity scores such as acute physiology and chronic health evaluation (APACHE) II as well as sequential organ failure assessment (SOFA) scores have been validated as poor-outcome stratifications in patients with sepsis, but are unwieldy and tend to be used more for audit and research than clinical decision making. Therefore, a rapidly available biochemical test that provides similar or better prognostic information could be useful. Several studies (22, 23) showed that BNP level was related to APACHE II and SOFA scores. In some observations, comparison of prognostic value of BNP with clinical severity scores suggested BNP as a good prognostic marker in predicting sepsis state and its mortality and morbidity. In the present study, pooled sensitivity and specificity of the elevated BNP level for predicting sepsis state were 66.7% and 60%, respectively, which was consistent with other studies mentioned in a recent meta-analysis (10). So far, none of the proposed prognostic markers had sufficient (more than 90%) sensitivity and specificity to predict which patients were at greater risk of death due to sepsis (24). Accordingly, a BNP measurement may provide a better prognostic value in combination with other biomarkers, each mirroring different pathophysiological aspects. Further study is required to verify this hypothesis and evaluate the cost-effectiveness in sepsis. We would like to thank Mrs. A. Tabatabaei for her excellent and helpful technical assistance. Implication for health policy/practice/research/medical education: Finding more diagnostic and prognostic factors for sepsis can simplify rapid and accurate diagnosis and management of sepsis. BNP could be one of these factors. Authors’ Contributions: Mitra Barati: concepts, design, clinical studies, manuscript preparation, manuscript review; Leila Farni: concepts, clinical studies, data acquisition, data analysis, statistical analysis, manuscript preparation; Mohammad Ali Eshaghi: concepts, definition of intellectual content, manuscript review; Mahshid Talebi-Taher: concepts, definition of intellectual content, manuscript review. Newsha Farhadi: literature search, data acquisition, data analysis. Financial Disclosure: The authors had no proprietary interest in any aspect of this study. Funding/Support: The study was financially supported by Research Center of Pediatric Infectious Diseases, Iran University of Medical Sciences.